Campaign finance refers to all funds raised to promote candidates, political parties, or policy initiatives and referenda. Political parties, charitable organizations, and political action committees (in the United States) are vehicles used in aggregating funds to keep campaigns alive. "Political finance" is also popular terminology, and is used internationally for its comprehensiveness. Campaign finance deals with "the costs of democracy", a term coined by G. Alexander Heard for his famous analysis of campaign finance in the U.S. Political campaigns have many expenditures, such as the cost of travel of candidates and staff, political consulting, and the direct costs of communicating with voters via media outlets. Campaign spending depends on the region. For instance, in the United States, television advertising time must be purchased by campaigns, whereas in other countries, it is provided for free. The need to raise money to maintain expensive political campaigns diminishes ties to a representative democracy because of the influence large contributors have over politicians. Although the political science literature indicates that most contributors give to support parties or candidates with whom they are already in agreement, there is wide public perception that donors expect government favors in return. (such as specific legislation being enacted or defeated), so some have come to equate campaign finance with political corruption and bribery. These views have led governments to reform campaign financing in the hope of eliminating big money influence. The causes and effects of campaign finance rules are studied in political science, economics, and public policy, among other disciplines. Some countries rely heavily on private donors to finance political campaigns. In these countries, fundraising is often a significant activity for the campaign staff and the candidate, especially in larger and more prominent campaigns. For example, one survey in the United States found that 23% of candidates for statewide office surveyed say that they spent more than half of their scheduled time raising money. Over half of all candidates surveyed spent at least 1/4 of their time on fundraising. One study finds that political donations gives donors significantly greater access to policymakers. The tactics used can include direct mail solicitation, attempts to encourage supporters to contribute via the Internet, direct solicitation from the candidate, and events specifically for the purpose of fundraising, or other activities. Most countries that rely on private donations to fund campaigns require extensive disclosure of contributions, frequently including information such as the name, employer and address of donors. This is intended to allow for policing of undue donor influence by other campaigns or by good government groups, while preserving most benefits of private financing, including the right to make donations and to spend money for political speech, saving government the expense of funding campaigns, and keeping government from funding partisan speech that some citizens may find odious. Supporters of private financing systems believe that, in addition to avoiding government limitations on speech, private financing fosters civic involvement, ensures that a diversity of views are heard, and prevents government from tilting the scales to favor those in power or with political influence. These kinds of donations can come from private individuals, as well as groups such as trade unions and for-profit corporations. However, critics of this system claim that it leads to votes being "bought" and producing large gaps between different parties in the money they have to campaign against. Other countries choose to use government funding to run campaigns. Funding campaigns from the government budget is widespread in South America and Europe. The mechanisms for this can be quite varied, ranging from direct subsidy of political parties to government matching funds for certain types of private donations (often small donations) to exemption from fees of government services (e.g., postage) and many other systems as well. Supporters of government financing generally believe that the system decreases corruption; in addition, many proponents believe that government financing promotes other values, such as civic participation or greater faith in the political process. Not all government subsidies take the form of money; some systems require campaign materials (often air time on television) to be provided at very low rates to the candidates. Critics sometimes complain of the expense of the government financing systems. Conservative and libertarian critics of the system argue that government should not subsidize political speech. Other critics argue that government financing, with its emphasis on equalizing money resources, merely exaggerates differences in non-monetary resources. In many countries, such as Germany and the United States, campaigns can be funded by a combination of private and public money. In some electoral systems, candidates who win an election or secure a minimum number of ballots are allowed to apply for a rebate to the government. The candidate submits an audited report of the campaign expenses and the government issues a rebate to the candidate, subject to some caps such as the number of votes cast for the candidate or a blanket cap. For example, in the 2008 election, candidates for the Legislative Council of Hong Kong were entitled to a rebate up to HK$11 per vote. Money is never an unproblematic part of the political system, and regulation is desirable. The context and political culture must be taken into account when devising strategies for controlling money in politics. Effective regulation and disclosure can help to control adverse effects of the role of money in politics, but only if well conceived and implemented. Their study also affirmed the perspective laid down by the Council of Europe, when discussing the concept of effective regulation of campaign financing: "[We are] convinced that raising public awareness on the issues of prevention and fight against corruption in the field of funding of political parties is essential to the good functioning of democratic institutions." ^ Heard, Alexander, The Costs of Democracy, Chapel Hill NC: University of North Caroline Press, 1960. ^ Holtz-Bacha, Christina (2008). Encyclopedia of Political Communication. SAGE Publications. p. 3. ISBN 978-1412917995. ^ "SOFT MONEY AND CAMPAIGN FINANCE REFORM: Start Your Search!". eds.b.ebscohost.com. Retrieved 2016-11-20. ^ Ansolabehere, Stephen; John de Figueiredo; James M. Snyder, Jr. (2003). "Why Is There So Little Money in U.S. politics?". Journal of Economic Perspectives. 17 (1): 105–30. CiteSeerX 10.1.1.455.6486. doi:10.1257/089533003321164976. ^ "FULL DISCLOSURE: THE NEXT FRONTIER IN CAMPAIGN FINANCE LAW: Start Your Search!". eds.a.ebscohost.com. Retrieved 2016-11-20. ^ "Begging for Bucks". Campaigns and Elections. Archived from the original on 2004-09-16. Retrieved 2007-03-12. ^ Kalla, Joshua L.; Broockman, David E. (2015-04-01). "Campaign Contributions Facilitate Access to Congressional Officials: A Randomized Field Experiment". American Journal of Political Science. 60 (3): 545–558. doi:10.1111/ajps.12180. ISSN 1540-5907. ^ Will, George F. (11 December 2005). "'Don't Ask, Don't Tell' Hypocrisy" – via washingtonpost.com. ^ Smilov, Daniel; Jurij Toplak (2007). Political Finance and Corruption in Eastern Europe. Ashgate Press. ISBN 978-0-7546-7046-9. ^ a b c Öhman, Magnus; Zainulbhai, Hani. Political Financial Regulation: The Global Experience (PDF). Washington, DC: International Foundation for Electoral Systems. ISBN 978-1-931459-42-6. ^ "UNITED NATIONS CONVENTION AGAINST CORRUPTION" (PDF). ^ Ohman and Zainulbhai. Political Financial Regulation: The Global Experience (PDF). pp. 13–14. Heard, Alexander (1960). The Costs of Democracy. Chapel Hill, NC: The University of North Carolina Press. Ohman, Magnus; Zainulbhai, Hani (2009). Political Finance Regulation: The Global Experience (PDF). Washington, DC: International Foundation for Electoral Systems. ISBN 978-1-931459-42-6. Archived from the original (PDF) on 2011-06-16. Retrieved 2009-11-20. Will, George (2005-12-11). "'Don't Ask, Don't Tell' Hypocrisy". The Washington Post. Washington, DC. Retrieved 2007-03-12. Abramoff, Jack (November 7, 2011). Capitol Punishment: The Hard Truth About Washington Corruption From America's Most Notorious Lobbyist. WND Books. ISBN 978-1-936488-44-5. Ackerman, Bruce; Ian Ayres (February 10, 2004). Voting with Dollars. Yale University Press. ISBN 978-0-300-10149-2. Birnbaum, Jeffrey (June 6, 2000). The Money Men : The Real Story of Fund-raising's Influence on Political Power in America. Crown. ISBN 978-0-8129-3119-8. Bike, William S. (2012). Winning Political Campaigns: A Comprehensive Guide to Electoral Success. Central Park Communications. ISBN 978-1-452499-82-6. Clawson, Dan; Alan Neustadtl; Mark Weller (May 1998). Dollars and Votes: How Business Campaign Contributions Subvert Democracy. Temple University Press. ISBN 978-1-56639-626-4. Coate, Steven (2004). 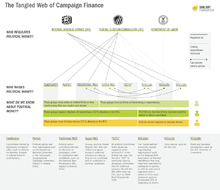 Pareto Improving Campaign Finance Policy. American Economic Review. Green, Mark (2004). Selling Out: How Big Corporate Money Buys Elections, Rams Through Legislation, and Betrays Our Democracy. Regan Books. ISBN 978-0-06-073582-1. New York mayoral candidate who lost to Bloomberg. Malbin, Michael J. (March 2006). The Election After Reform: Money, Politics, and the Bipartisan Campaign Reform Act. Rowman & Littlefield Publishers, Inc. ISBN 978-0-7425-3870-2. Smilov, Daniel; Jurij Toplak (2007). Political Finance and Corruption in Eastern Europe. Ashgate Press. ISBN 978-0-7546-7046-9. Smith, Bradley A. (March 1, 2001). Unfree Speech : The Folly of Campaign Finance Reform. Princeton University Press. ISBN 978-0-691-07045-2. Talbot, Stephen (1992). The Best Campaign Money Can Buy (TV-Series). United States: Frontline (PBS Video); Center for Investigative Reporting.